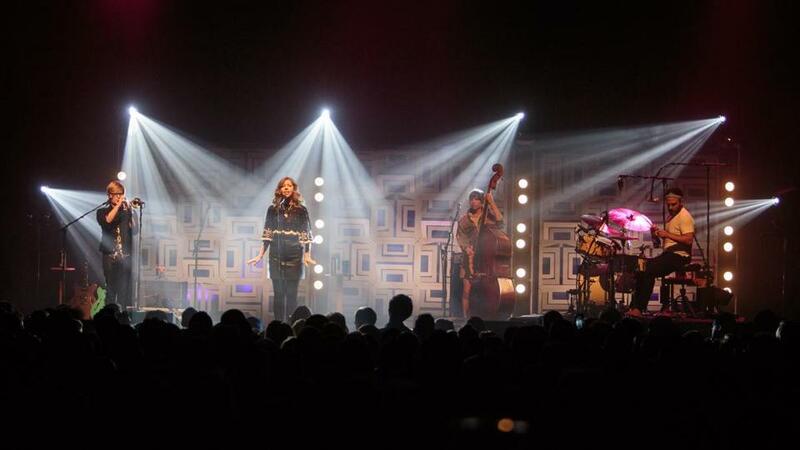 Lake Street Dive — (from left) Mike Olson, Rachael Price, Bridget Kearney, and Mike Calabrese — performing at the House of Blues. Now, the group had returned for a sold-out show with a reason to celebrate: “Side Pony,” its first major-label release, which came out on Nonesuch in February. The album, recorded in Nashville, isn’t so much a changeup of Lake Street Dive’s thoroughly pleasant sound but an enhancement of it: Tracks like the “little revenge song” “Spectacular Failure” and the pleading “Call Off Your Dogs” amped up the band’s best qualities. “We owe a lot of gratitude to this city,” Price said near the end of the set, before listing off local venues Lake Street Dive had played in during its journey to major-label status: now-closed spots like “the bubble tea place on Boylston” and the Cambridge bar All Asia, intimate rooms like Cambridge’s Toad and Club Passim, and bigger venues like the Sinclair, Royale, and, of course, House of Blues. It provided a nice callback not just for Lake Street Dive, but also for the fans who were welcoming the band home.